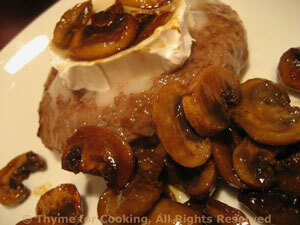 Cheeseburgers with Sautéed Mushrooms, Thyme for Cooking summer recipes. Simple grilled burgers topped with a thick wedge of runny Brie or goat cheese and sautéed mushrooms: adult cheeseburgers. We normally eat burgers with a fork and a glass of red. Feel free to have them on a bun with a Mountain Dew. Put bread crumbs, ketchup, Worcestershire sauce, garlic, and thyme in a medium bowl and mix well. Add the beef. Mix well - hands work best, and form into 3 or 4 patties. Cook on barbecue grill over direct heat for 3 - 5 minutes per side, using a grill pad or pan if you have one, it's easier. Or sauté in a nonstick skillet for the same amount of time. When burgers are almost done, move off heat and top with the cheese. Cover for a minute if possible. Remove as soon as cheese starts to melt, spoon some mushrooms over and serve. Heat 2 tsp oil, 2 tsp Worcestershire and soy sauce in medium nonstick skillet over medium heat. Add sliced mushrooms and sauté until nicely glazed, stirring and turning frequently, about 7 minutes.